Carrots so sweet and tender, they almost could be mistaken for candy! Did I say candy? Yes, even after all the candy we had around here during Easter, I was craving a different and sweet way to show off gorgeous spring carrots. Craving spring sweetness? 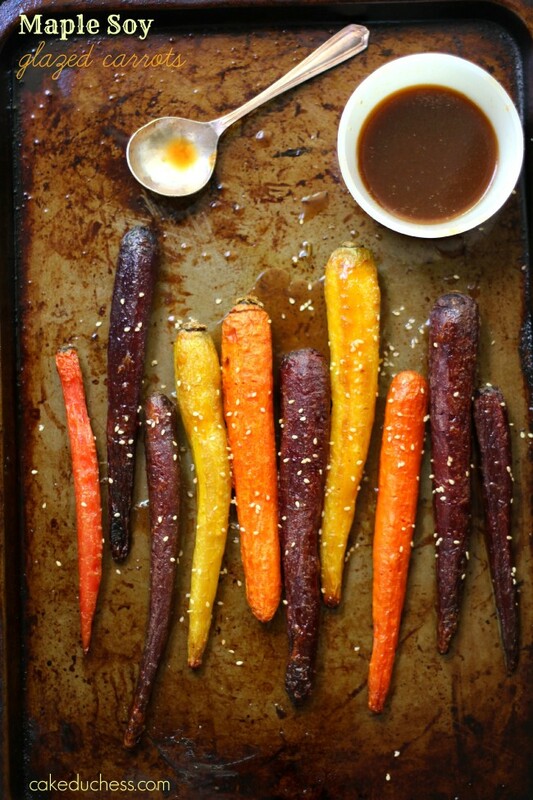 You’ll love these maple soy glazed carrots. I recently had the chance to go on a sort of scavenger hunt on a blog I’m very familiar with. 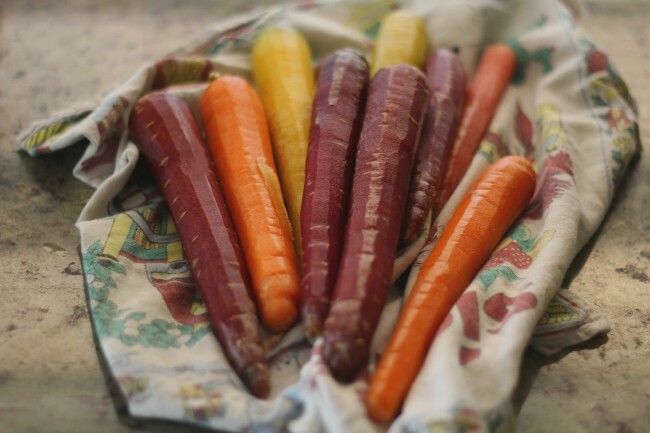 How did these gorgeous maple soy spring carrots come about and what does it have to do with bloggers C.L.U.E? I was searching through salads, and I decided to go in the direction of carrots! So what was this hunt all about? The hunt was for a group I just became a part of called blogger C.L.U.E. and the blog I was given to search through was my friend Lisa from Authentic Suburban Gourmet. When I started my hunt through her blog, I was impressed with her collection of 39 different salads!! 39! And they are all so very interesting. I was inspired by her roasted spring carrots with cumin scented pistachios. While you’re on Lisa’s site, don’t miss her Japanese Style Pancakes (they look fantastic!). I am always looking for new cookie inspiration, and love her chocolate, coconut, butterscotch oatmeal cookies. Lisa lives in California and has wonderful posts on wine…but I almost forgot to mention her Friday Night Bites series…it’s just delectable! I was in love with the idea of cumin scented pistachios, but thought I better stick to something even the kiddos would like. I made a glaze that I like to make for tofu and for some other Asian style dishes. This glaze is so cool! You can change it up with different flavors. If you don’t have maple syrup on hand, add some brown sugar. Feeling adventurous? Booze it up a little!! Bourbon would be quite perfect! I was thinking beyond the carrots when I made the glaze, and decided to use it for a turkey roast we were having that night as well. Boy, was it a great decision! Do you have any spring celebrations coming up? These carrots would be perfect for a spring celebration like Easter served with a lovely baked ham. I’m thinking if you are finally experiencing warmer weather, you may want to dine outside on a Sunday and you could impress your guests with these sweet carrots which are so easy to make!! Today is reveal day, and this month’s theme is: Spring Vegetables. Join me in reading about the food hunted down this month in the #bloggerCLUE member’s kitchens! 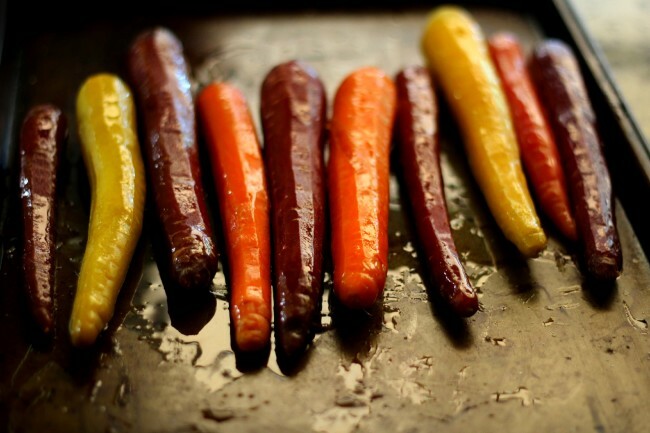 Place the carrots on baking sheet drizzling 3 tablespoons olive oil over all the carrots. Season with salt and pepper. Rub the mixture evenly all over the carrots with your hands. Roast for 30 minutes or until carrots are slightly browned and fragrant and tender when pierced with a fork. While carrots are roasting, place soy sauce, orange juice, water, garlic cloves, rice wine vinegar and toasted sesame oil in a small saucepan over medium-high heat. Bring to a simmer and cook the soy sauce mixture until it is reduced by half, about 4 minutes. Add maple syrup, stirring to dissolve. Cook 5 more minutes, until the sauce slightly covers the back of a spoon and look syrupy (it will thicken up when it cools). You could discard the garlic cloves or eat them if you love them!! Keep sauce warm until carrots are done. Toss carrots in warm glaze (add as much or as little as you would prefer. Depending on how much glaze you like. I added the rest of the glaze on my roast I made. ), sprinkle on sesame seeds, and serve immediately.